located about 1,300 light-years away from Earth in the constellation of Cygnus, in the outer edges of the galaxy. The mysterious dimming and flickering of the star, first discovered in 2011, means something is passing in front of it. It has puzzled astronomers ever since, but this is the first time they’ve seen it dimming in real time, presenting an extraordinary opportunity to observe whatever it is that’s blocking the star’s light. why exactly does an alarm need to be sounded? this whatever star is 1500 light years away from us. 1500 years ago. 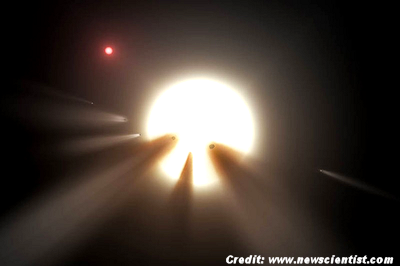 hey astronomers; just keep y'alls eyes peeled, OK?